Bachmann’s E-Z App™ bluetooth smart trains are available now. These smart trains support wireless firmware updates, can be controlled from over 100 ft, and require no special equipment to operate (other than power and a smart device). This pairing of a traditional toy (like trains) with high-tech touch devices makes trains accessible again to young and old, and creates a new platform for games and user experiences that work in conjunction with model trains. The iOS app is compatible with MFI approved game controllers. Visit E-ZAppTrainControl.com to see all E-Z App™ products. Maiden voyage of an O gauge loco with a BlueRail board operating on battery power. The majority of 3-Rail (and all 2-Rail) locos will operate on DC power, making them great candidates for battery power operation. You will be surprised how much smoother the same loco will operate on battery power vs. track power. No matter how well you clean your track, all the micro-imperfections of conducting electricity from track through the wheels have a visible affect on performance. I’m not telling you this to hype battery operation – its just an observation I’ve made from operating the same loco under both conditions for a variety of locos. This video shows how to add a mini-bluetooth speaker to your Bachmann E-Z App&TM or BlueRail Train for onboard sound. This solution can only be used for a single loco, but the cost, quality, and ease of implementation make it a great solution for what it is. 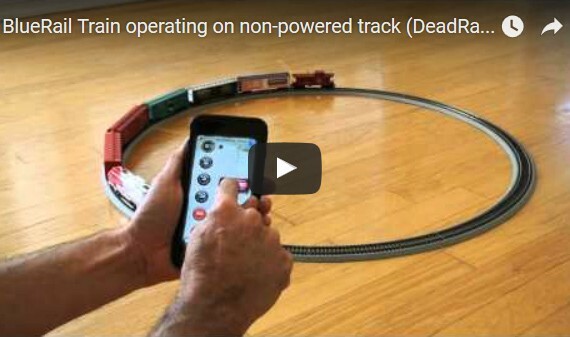 BlueRail Trains collaborated with accomplished rockabilly guitar player Buzz Campbell (Lee Rocker Band, Hotrod Lincoln) to record a collection of train inspired Christmas songs designed to sync with operation of model trains. The idea was to create a musical motion/light experience for trains around the Christmas tree or for use with Christmas villages. Each song depicts the train leaving and arriving from station to station (with matching train sound effects, bells, train whistles, winter wind and tempo changes). The audio respects whether you have your train set to “diesel” or “steam” for synced horn/whistle sounds, and is about 15 minutes of music (for all 9 tracks). 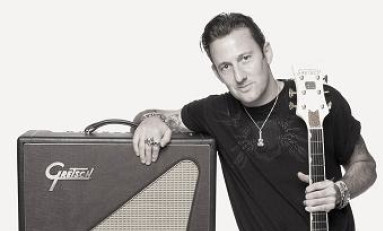 Campbell’s classic rockabilly and Chet Atkins style gives the music an authentic train feeling. If Christmas trains aren’t your thing, this demonstrates this system’s ability to record and playback scripted train operation. This would be useful for users saving custom behaviors of their train traveling from station to station on your layout, or easily generating back and forth routes for a shelf-top train or trolley. In the most general sense, this demonstrates that this system opens new doors to what trains can do. 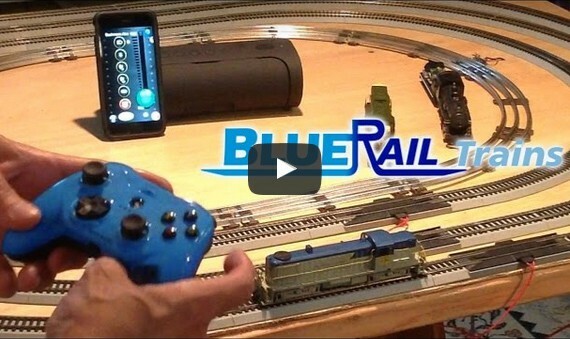 Here is an early video of our first usage of battery to run a BlueRail Train. You are surely impressed by that circle of track. Because bluetooth smart does not rely on signals through the track, it is a perfect candidate for battery operation. All BlueRail plugin boards have 2 connection points to which you can attach a battery. The trains will draw from the rails if they find power there, and look to the battery connection if they do not. We do not support charging from the rail at this time. We have added support in the BlueRail protocol for MFI supported controllers. We have tested with the Mad Catz CTRLi. In theory it should function with any of these controllers. Once you have paired your controller with the smart device, connect to your trains in the app. At this point you can operate your trains with the controller. Even if game controllers aren’t your thing, recognize that this represents a nice model of a plastic throttle with a lower tendency for obsolescence. An MFI approved throttle could easily be created with the ergonomics for model train control, and because the throttle communicates generically with the smart device, the software and firmware that control the train can be routinely updated without impacting the throttle. We think this is a nice model for people who prefer a handheld controller. For information and preferred status on future board orders, please use our contact page.